During meetings with the Club throughout the 2018-19 season, the FST has underlined concerns from amongst our members at the affordability of the pricing strategy adopted by the Club for all but the first fixtures of the season, and the impact that has had on the ability of fans to attend matches, and to encourage new fans to the Club. The Club asked for the Trust to present ideas for consideration for future seasons, and the Trust requested that the bulk of the March 2019 structured dialogue meeting time be given to presenting proposals and areas for discussion, to enable a thorough exploration of the issues of concern. The discussion was centred on a presentation of FST research, ideas and proposals, a summary of which is provided here. the lack of options for season ticket upgrades and exchange. When looking at match day ticket pricing it is important to focus on a ‘typical’ seat rather than the highest or lowest prices available. We know that the Club often advertises adult tickets “from £30” when in reality these are only available in the Family Section. Similarly, many supporters are upset about £75 tickets which aren’t necessarily sold in all parts of the ground. In order to compare with other clubs in the Premier League we targeted an adult ‘home end’ ticket and identified the lowest and highest price at each club. 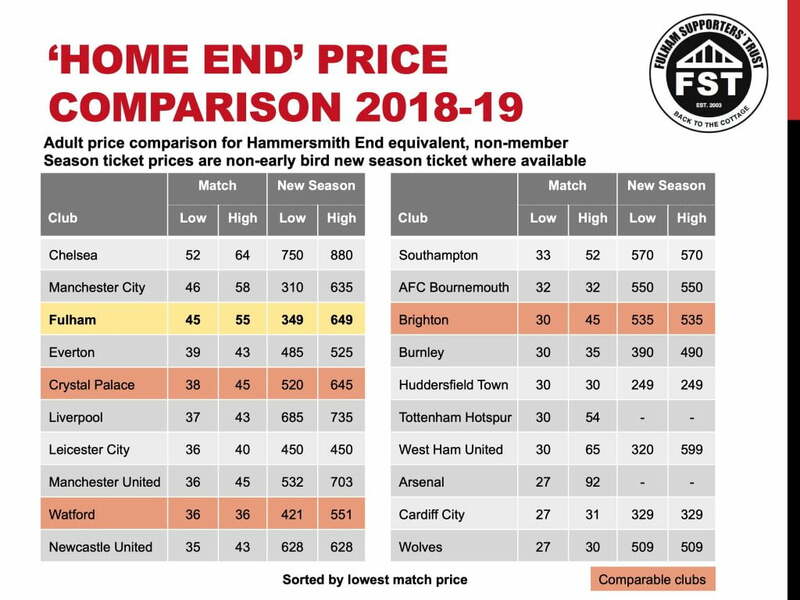 The following table shows how the Hammersmith End prices compare with the other clubs’ home ends and is sorted in decreasing order of the lowest possible match day ticket price. Some clubs charge the same for any home end seat, regardless of category of game or location of seat, whilst others have a number of match categories and also price bands within the stand. We have not included restricted view seats in this analysis. The match day ticket price comparison shows Fulham in an unwanted – from supporters’ point of view – top three place with the cheapest home end ticket of £45 for a category B match only topped by Chelsea and Manchester City. It is interesting to note that Cardiff and Wolves – the two other promoted clubs – offer the cheapest home end seats. In order to find a reasonable comparison we identified a small family of clubs who might be considered to be similar to Fulham in terms of geography, capacity, overall size and aspirations – Crystal Palace, Brighton and Watford. These are highlighted in the table. It is clear that match day pricing is £10 to £15 more expensive than these comparable clubs. Not shown here is the much narrower spread of ticket prices at these clubs, the highest price tickets in any part of the ground being £53 (Crystal Palace), £42 (Watford) and £65 (Brighton). The table of adult home end prices also includes the range of new season ticket prices at each club for the 2018-19 season where available. In order to best rationalise the information we have not included ‘early bird’ offers. Here the range of prices for each club depends upon the location in the stand and date of purchase; Fulham’s Hammersmith End prices range from pre-promotion H1 (£349) to post promotion H4 (£649). The following table shows the information sorted in decreasing order of lowest new season ticket price. Note that the prices at Arsenal and Tottenham were not available. 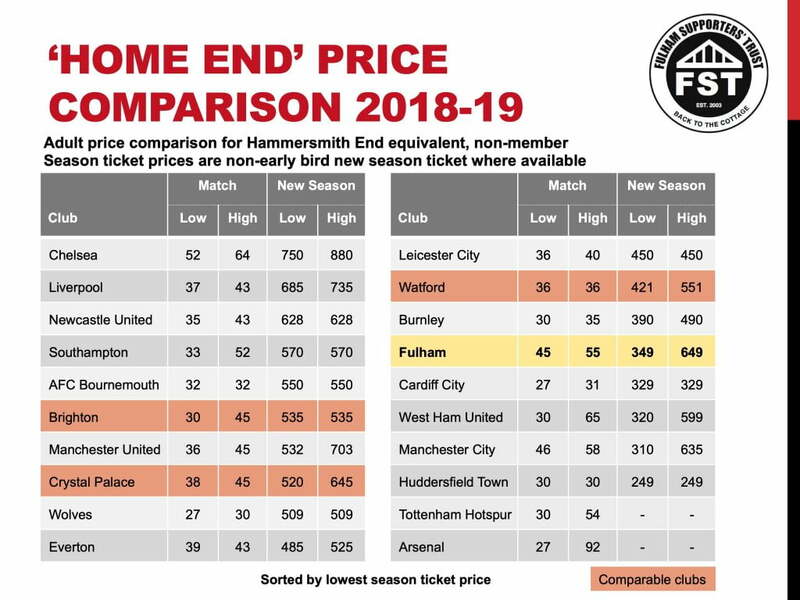 It is clear from this table, which also highlights the small family of similar clubs, that Fulham’s season ticket pricing is extremely competitive, with a lowest price bettered by only four clubs. 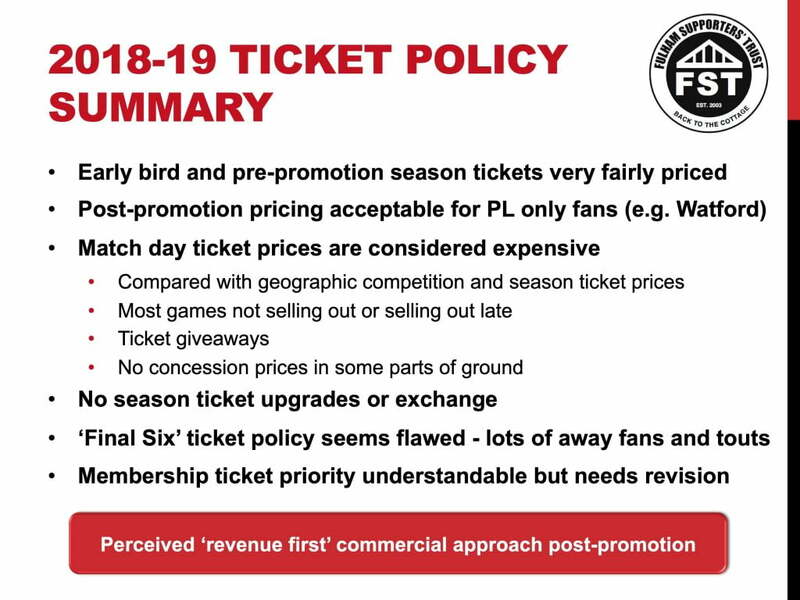 The conclusion we draw from this information is that Fulham’s match day pricing is too expensive and likely to deter fans who cannot afford a season ticket. This is not a sensible strategy for the long term development of the Club. This is particularly the case when seen in the light of matches which either do not sell out or sell out late and tickets that have been given free to local residents and others. However season tickets are priced fairly and it is reasonable to charge a higher price for season tickets purchased after promotion. This is a model adopted by Watford who continue to have a twin-stream season ticket pricing policy. Overall we feel that the match day pricing strategy combined with other commercial decisions relating to season ticket benefits, memberships and the ‘Final Six’ sales policy has led to a perception of a ‘revenue first’ commercial approach since promotion to the Premier League. We fear losing long-standing genuine fans as a result. It is important to have a clear set of principles relating to ticket pricing so that all supporters can clearly understand the strategy and see that it is fair. The Trust’s pricing principles emphasise clarity, reasonableness and recognition of regularity and longevity of support. 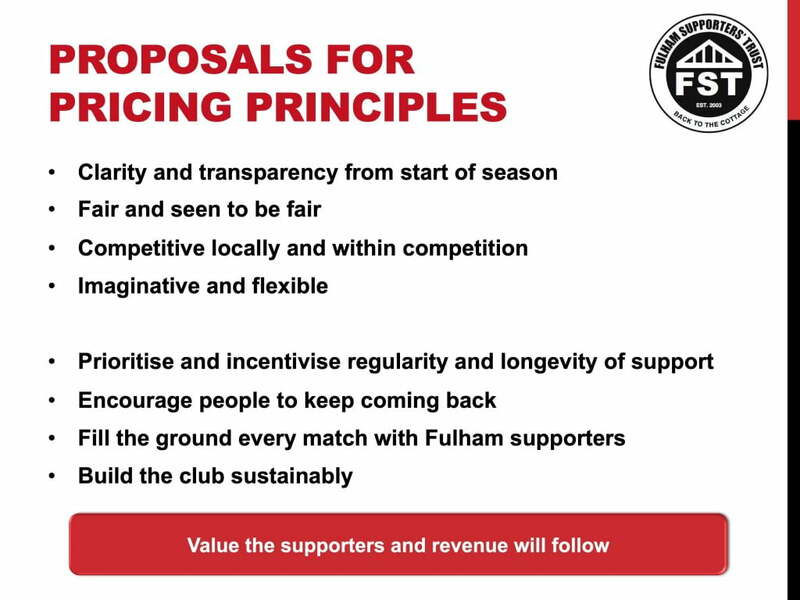 Ultimately we want to have Craven Cottage sold out to Fulham fans at fair prices every week; this is the best way to build the Club sustainably. Many supporters who have held season tickets for a long time fear a price increase to the post-promotion levels should the club stay in the Premier League. Significant numbers have contacted the Trust to say that they would not be able to continue to attend if the prices were to be increased to these levels. However we do think it is reasonable to charge a higher price for those who chose a season ticket only after promotion (the Watford model). We believe that the season ticket prices charged for supporters who committed to the Club regardless of division were fair and highly competitive both locally and within the Premier League. Our recommendation for 2019-20 season tickets is a blanket real price freeze, regardless of division. Often when a price freeze is announced it really means that the new early bird price matches the standard price of the previous season. 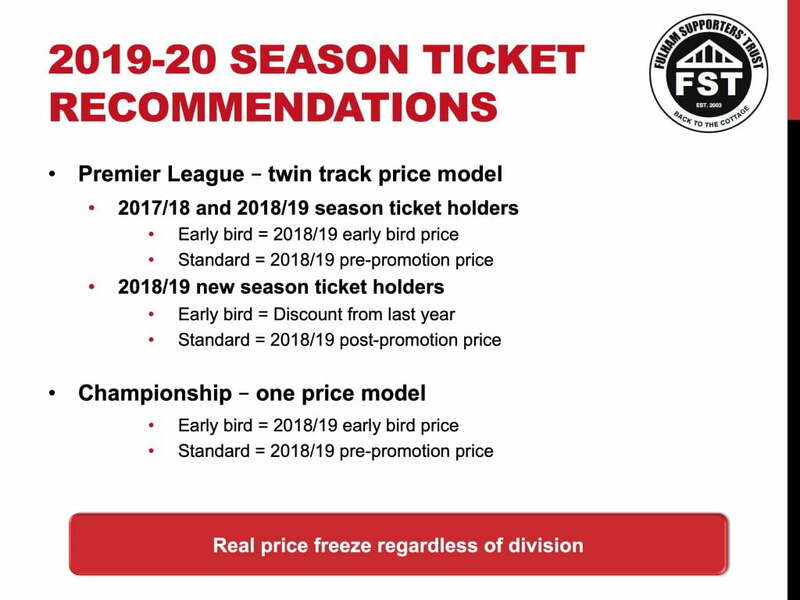 We suggest that for 2019-20 both early bird and standard prices are frozen at this season’s levels. This will clearly mean a per-game price reduction in the event of relegation due to the addition of four more matches. There would be no post-promotion price should the Club be relegated. A significant difference between season ticket benefits offered this season and previously is the withdrawal of the ability to upgrade concession season tickets without paying a full match price (with the exception of evening fixtures). We have raised this repeatedly during the course of the year but the Club has been unwilling to change its stance, citing abuse of the system by significant numbers of people. We believe this penalises genuine supporters and that the situation is made worse by the unavailability of a season ticket exchange and high match ticket prices. Trust research has shown that all clubs in the Premier League with the exception of Fulham offer at least a season ticket exchange or an upgrade scheme. 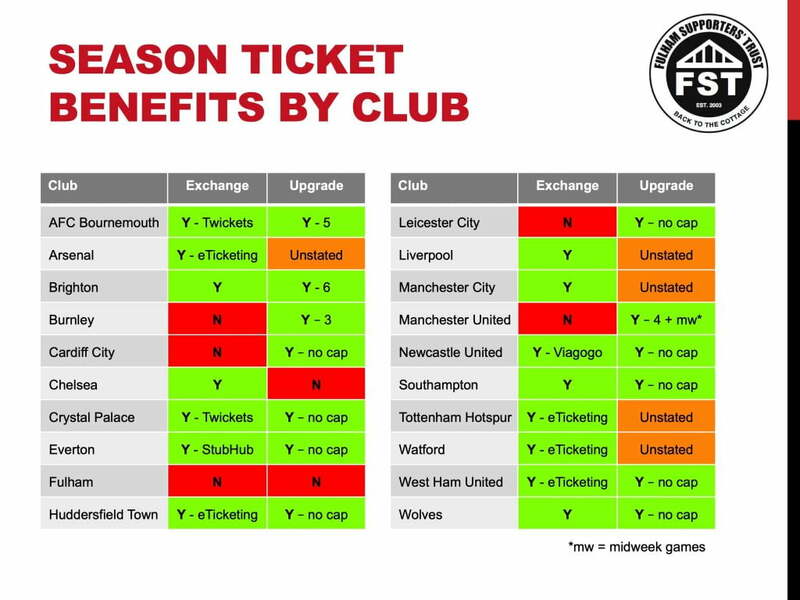 Some clubs do cap the number of times it is possible to upgrade a season ticket which seems reasonable. Others appear to offer unlimited upgrades although it is possible that there is small print in their terms and conditions to provide a cap. We believe it is fair to offer a capped season ticket upgrade policy and to implement a season ticket exchange scheme as a key benefit to season ticket holders. As previously discussed, a significant source of disaffection amongst supporters this season stems from high match day prices. Anecdotal evidence and also comparison with other clubs of similar size and status suggests that prices are in the range £10-£15 per seat too high. We have built a trial 2019-20 Premier League model that sees prices reduced by £10 at the Hammersmith End, £15 at the Putney End to ensure the same prices behind the goals and £10-£15 at the sides of the ground. The model also includes concession prices in all areas and a hypothetical price for Riverside seats for analysis purposes. 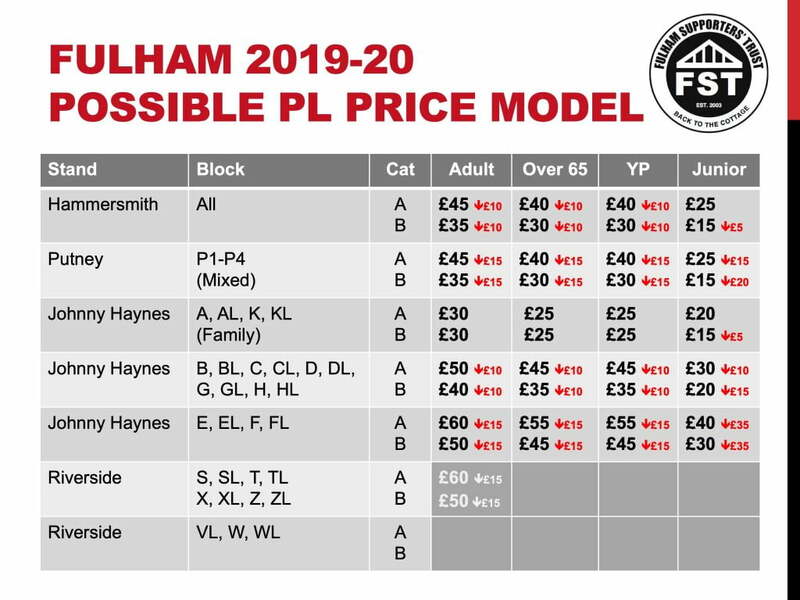 We are seeking the detailed views of Fulham supporters about these prices via a Fan Survey and will modify the model accordingly. It is important to understand the revenue impact of reducing ticket prices, which is the purpose of our 2019-20 model. We know that approximately 7,400 tickets are available to be sold on a match by match basis once season tickets and away fans are accounted for. These are mainly in the Putney End (4,100) and we have assumed the remainder are split evenly between the Hammersmith End and the non-central blocks of the Johnny Haynes Stand and Riverside Stands. If we assume that all matches currently sell out at 2018-19 match day prices then a ‘rule of thumb’ calculation shows that our revised model would lead to a maximum revenue loss of £100,000 per match or £1.9M per season. For comparison purposes, this is equivalent to the merit money earned by the Club for each league position (finishing one place higher could cover the maximum revenue loss of this ticket price reduction). 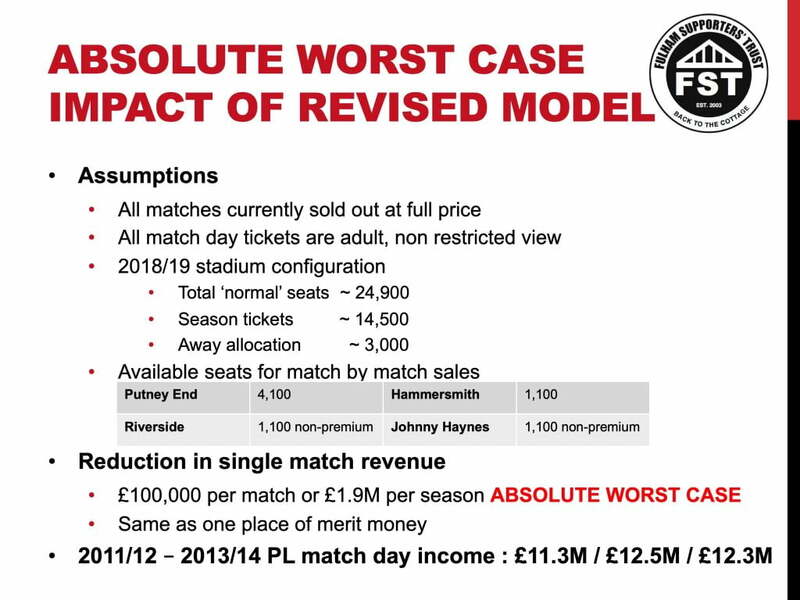 Of course matches haven’t been selling out, nor does this model factor in the additional revenue generated by larger crowds spending extra on match day so the overall revenue drop would be smaller. It is also important to view this £1.9M number in the context of the final three years of match day income in our previous tenure in the Premier League. In that period match day income topped out at £12.5M. Match day prices can be reduced not just by dropping the headline price but also by offering creative ticketing models. 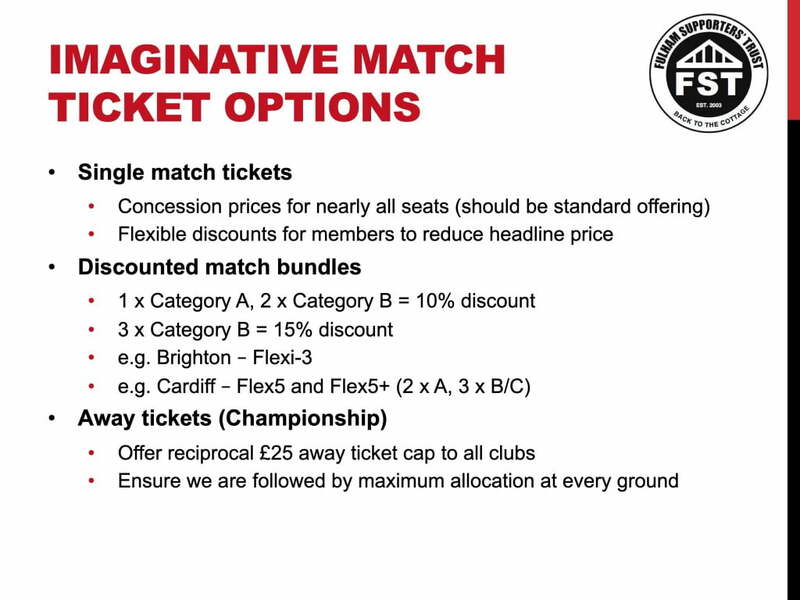 Other clubs, such as Cardiff and Brighton, offer a ticket bundle scheme where discounts are offered for supporters who buy, for example, two category A and three category B matches. These schemes reward supporters who plan to attend multiple matches but are not able to buy a season ticket for a range of reasons. A similar outcome can be achieved by providing better benefits to paying members, allowing them to recoup more than the cost of their membership. Additionally we would like Fulham to take the lead in offering a reciprocal £25 away ticket price in the Championship to ensure that we are followed on the road by the maximum allocation at each match. 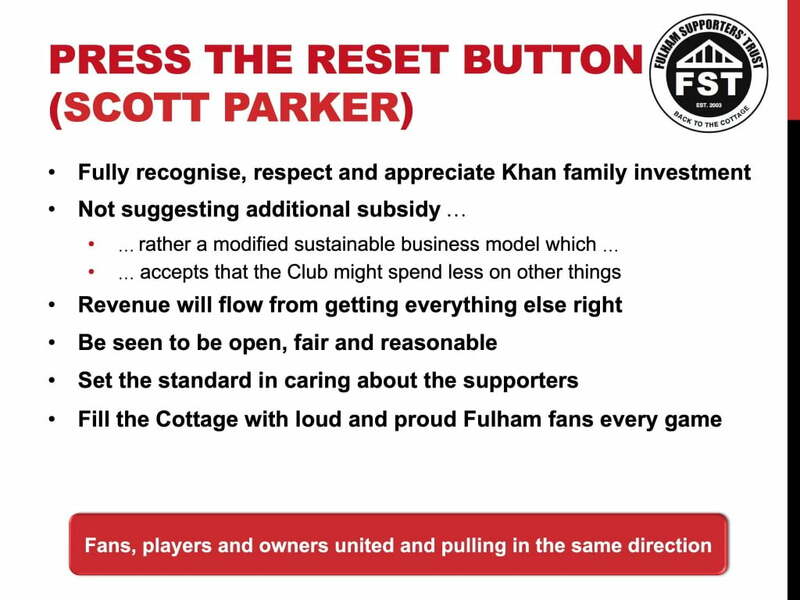 Scott Parker talked about ‘pressing the reset button’ in relation to a disconnect that has emerged this season between team and fans. We would like to do the same with ticketing policy. 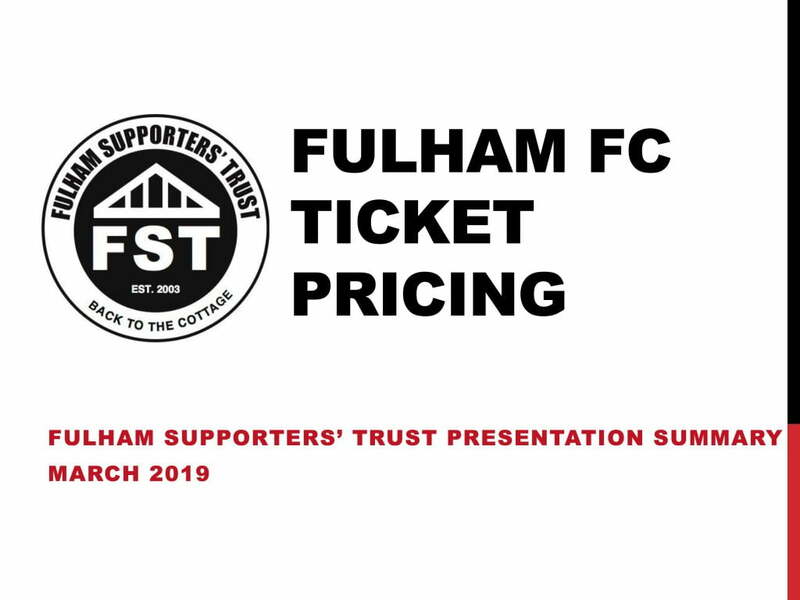 We share the owners’ desire for Fulham to be sustainable and successful and believe this is best achieved by valuing the fans and bringing everyone together. It is important to say that we are not suggesting additional subsidies to support a modified ticketing policy, particularly as the Club has been run at a significant operating loss for a number of seasons. We believe that the business model can be modified to ensure that tickets are reasonably priced with any fall in revenue covered by a reduction in spend. We want all supporters to be able to afford and enjoy watching Fulham – with fans, players and owners united and pulling in the same direction. Following this presentation, and relegation to the Championship, we prepared some additional material focussing on the second tier. You can read the supplemental slides here.